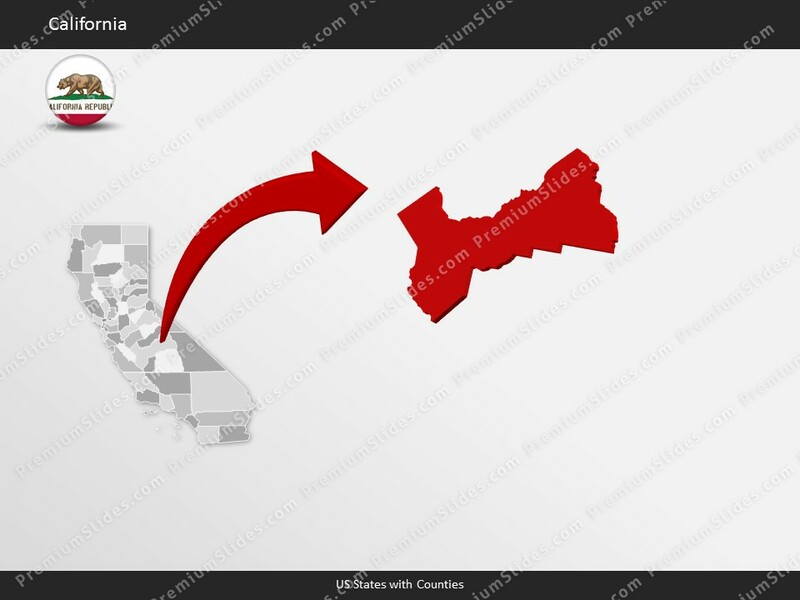 Premium PowerPoint Map of US State California. 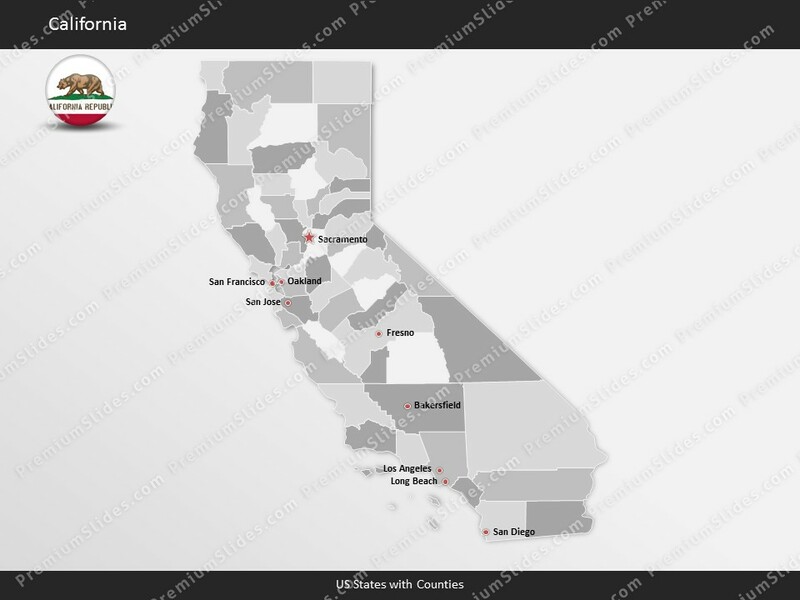 This detailed PowerPoint Map Template shows California counties, county names and biggest cities including the California state capital. 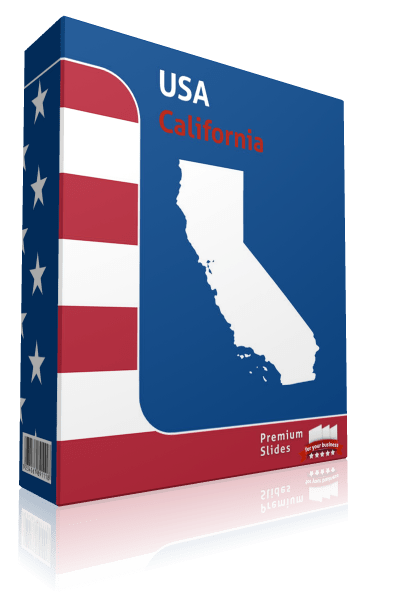 Premium PowerPoint Map of US State California. 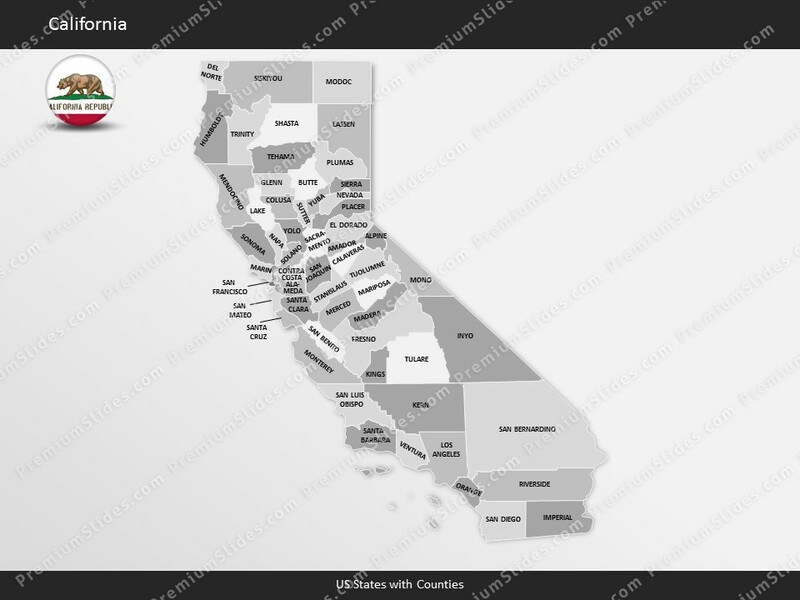 This detailed PowerPoint Map Template shows California counties, county names and biggest cities including the California state capital. 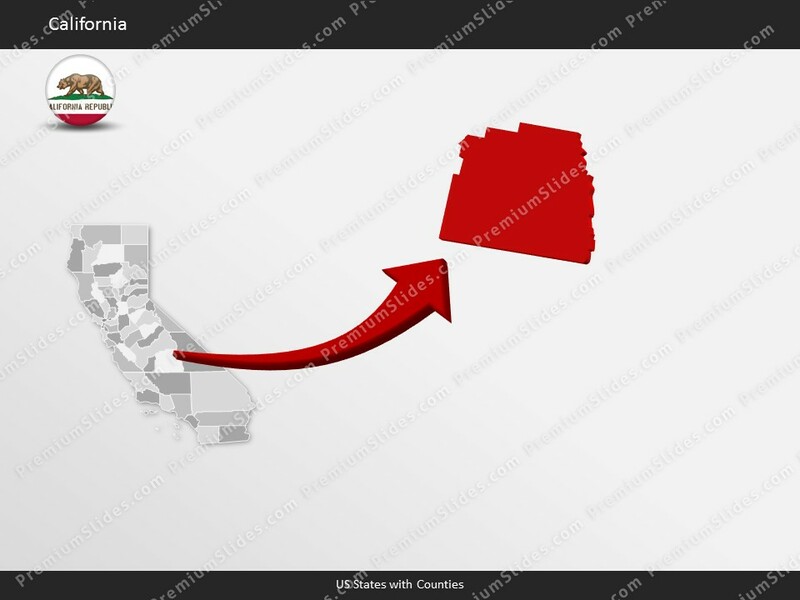 The California PowerPoint Map is hand drawn and fully editable in size and color. Specific territories can be highlighted easily with just 2 clicks in PowerPoint. 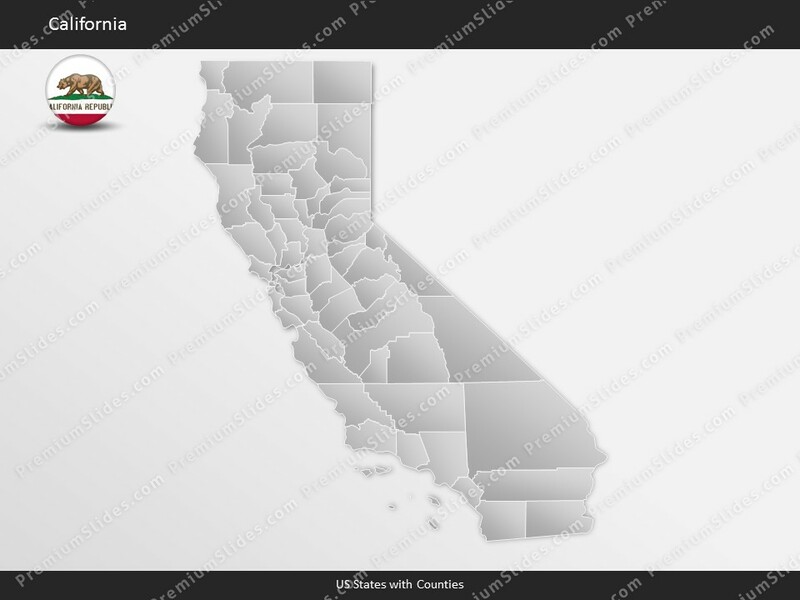 The California Map Template is a great benefit for showing sales data in this state. Do not wait! 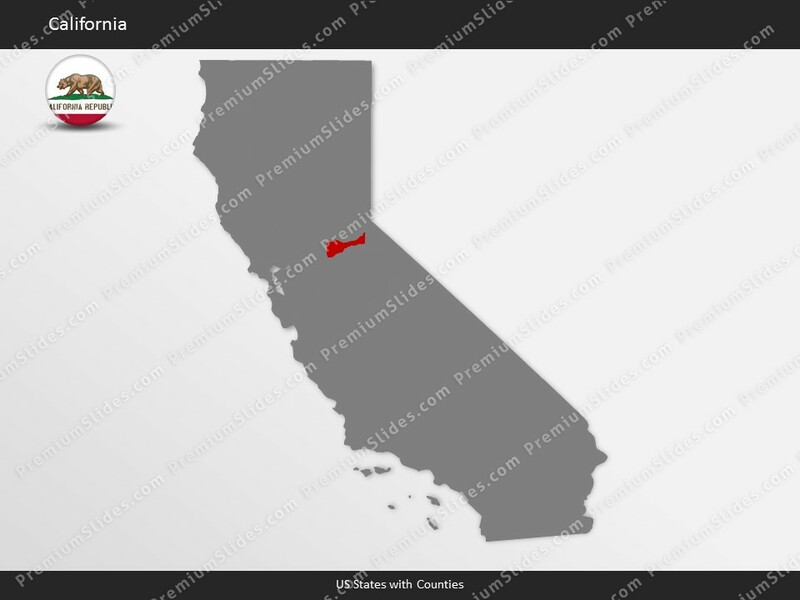 Get this Premium California Map Template for an unbeatable price today and impress your audience in your next meeting! Facts and information about California State you can use in your presentation. California (CA) is also known as the Golden State. The name California comes from the book "Las Sergas de Esplandián" written by Garcia Ordóñez de Montalvo in 1500. The date of admission to the Union was on September 9, 1850 out of unorganized territory (part). It is the 31st state to joining the other constituent entities. The motto of the state is: Eureka (I have found it). The total size of this US State is about 163,694 square miles. Therefore California ranks in 3rd place among all other US States in terms of land area. Actually 155,766 square miles are covered by land and 7,928 square miles are covered by water. The mean elevation is 2,9 feet. California's highest point is Mt. Whitney with a height of 14,494 feet. The lowest place is Death Valley, which is -2822 feet. Its geographic center can be found in Madera County, 38 miles east of Madera. California is bordered by the following states: Arizona, Nevada, Oregon. In 2015, 39,144,818 people lived in California. The majority of people do not live in the capital Sacramento. They live in the largest city Los Angeles. The residents are called Californian. California is the birthplace of these presidents: Richard M. Nixon was born on January 9, 1913 in Yorba Linda (In office January 20, 1969 – August 9, 1974). California is known for these industries: Electronic components and equipment, aerospace, film production, food processing, petroleum, computers and computer software, tourism. California is significant producer of agricultural products, including Vegetables, fruits and nuts, dairy products, cattle, nursery stock, grapes. California ranks 1st as the most visited place in the United States. California is included in the region known as the Western United States. In line with the Census Bureau the Western United States frequently referred to as the American West, the Far West, or simply the West is one of the four geographical determined regions. The area comprises the westernmost states of the United States. It is the biggest region of the country, covering more than half the land area of the United States. Silicon Valley, the Science and Industrial Park, is the place to find many of the world's largest high-tech companies, and thousands of start-up companies are placed in California. This is why this region has emerged as the most populous state and one of the top 10 economies in the world.